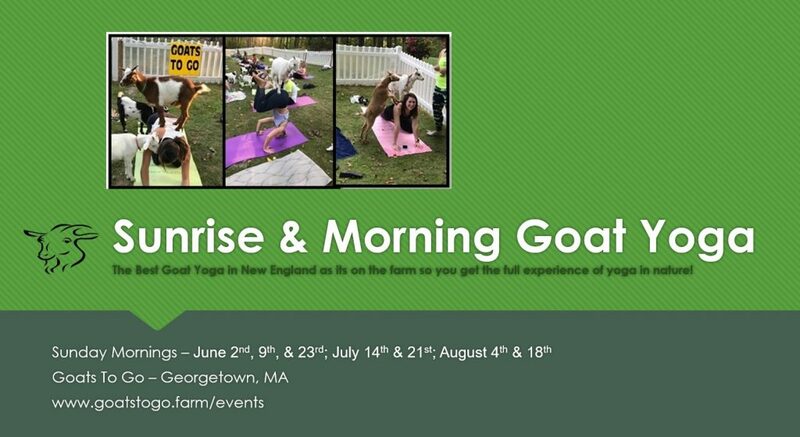 Join us on the farm for a 1 hour session of Goat Yoga accompanied by our baby fainting goat kids. The class is sequenced for all levels of yoga (beginners are welcome too!! ), and focuses on deepening the human connection to nature, nurturing communication with animals, as well as fostering mindfulness, breath, and meditation all in a gorgeous setting with some spectacularly fluffy and sweet assistants. It will be an upbeat yoga class as our kids will be bouncing on and off you throughout the whole class!!! Yoga Instructors will be Maggie Bresnihan, unless otherwise noted. Guest Teacher 6/9, 11:30AM will be Jessica Saporito . Guest Teacher 7/14 is Molly Bedocs- Gring. The session includes 45 minutes of gentle yoga while the goats interact with you, and a 15 minute cool down seated poses while you continue to hold, pat, snap pictures, and feed goat treats that are provided. July 21st. August 4th & 18th. September 8th & 22nd. Limited classes in October. Tickets: $35 per person. Tickets are non-refundable. Appropriate for ages 12+ yrs old (younger with prior approval).